1 Preheat oven to 180C. Melt half the butter in a large frying pan over medium heat, add leek and garlic and stir occasionally until starting to caramelise (6-7 minutes). Add spinach and rocket, stir until wilted (1-2 minutes), transfer to a colander to drain, then a bowl. Add cheeses, herbs and lemon rind, season to taste, mix well, set aside. 2 For tomato relish, heat oil in a frying pan over medium-high heat, add onion and garlic and stir occasionally until starting to caramelise (6-7 minutes). Add tomato, sauté until tomato begins to break down (4-5 minutes). Add vinegar and sugar, season to taste, cook until syrupy (2-3 minutes), then cool to room temperature. 3 Melt remaining butter and brush base and sides of a 20cm x 29cm loose-bottomed tart tin (see note), then line with a filo sheet, allowing pastry to overhang. Brush with butter, then lay over another filo sheet and repeat until filo is used. Spread spinach mixture in base, make 6 evenly spaced indentations in filling, set aside. 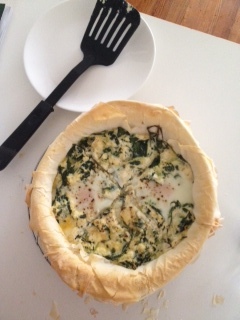 4 Whisk buttermilk and 3 eggs in a bowl to combine, season to taste, then pour onto spinach mixture. Crack remaining eggs into indentations and drizzle with oil. Brush pastry edges with butter and bake until tart is set and eggs are cooked medium (20-25 minutes). Serve with tomato relish. Me gusta para desayunar,se ve deli. Te quiero mucho hijo de mi corazón.